Working at school with a 1:1 Chromebook initiative, there is an expectation that technology will be used in the classroom, and most of our teachers are proficient in using online learning management systems such as Canvas or Google Classroom. A lot of our teachers will bring their Chromebooks to meetings to use to take notes, schedule future meetings, or access other information. Sometimes, teachers will come with paper and pen. Most of the time, when they do bring paper and pen, they apologize or share why they didn’t bring their Chromebooks. They’ve also apologized for having their students to take notes on paper instead of on their Chromebook. To ALL teachers everywhere who want apologize: Don’t! First of all, technology is too powerful to be an expensive notebook. Let’s have kids take notes on paper and use the technology to connect to a classroom in Finland. Or, let’s Skype with a scientist in Peru and learn “first-hand” about the climate, vegetation, and animal life there. What if the English classes have a Google hangout with the author of the short stories they read, and interview the author about the stories? 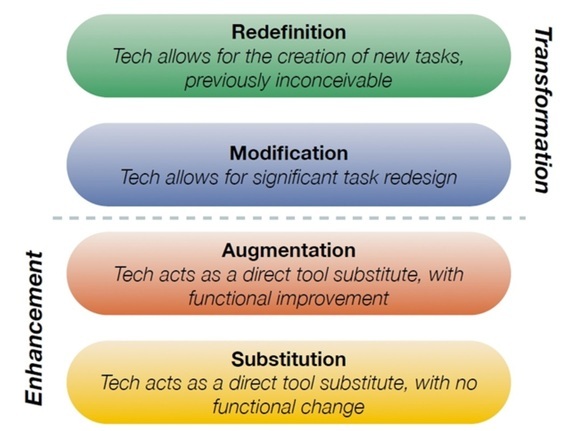 There are lots of ways to transform learning opportunities with technology, and several teachers at my school are taking the risk of “letting go” of being the sage on the stage and moving along the S-A-M-R continuum. One experiment found that the writing of letters left a motor memory in a specific area of the brain and “suggests that the sensorimotor system plays a role in the process of visual recognition during reading.” Another experiment involved two groups of adults who had to learn to write using an unknown alphabet of 20 letters. Several tests were conducted with recall and recognition of reversed letters, and the adults who had written their letters instead of typing them did better on all tests. The University of Stavanger. (2011, January 24). Better learning through handwriting. ScienceDaily. I find that I like to take notes by pen and paper, whether on sticky notes, in my journal, or even on an index card. I’ve found an “analog” way to stay organized with all of the projects and activities I’ve got going on, which I will share in a future post. How about you? Do you like to take notes, typing or writing? Do you use a paper or online planner? Let me know in the comments or on twitter at @jennifer_hogan. I agree wholeheartedly! I am a computer science teacher and believe that just because we have a computer doesn't mean that it is always the best tool to use for every learning activity. We need to look at the computer as another tool, just like pen and paper are tools. Using our hands in various ways to assist our learning and to stimulate connections in our brain should be the focus. I agree! I believe we are swinging way too far in one direction. There must be balance. Technology is great; however, there are basic skills we will always need.